Our skin-care routines, while meticulous, tend to only include the skin on our faces and bodies. What's clearly missing from that agenda? Our scalps. Sure, we douse our locks in nourishing argan oil and don the occasional protective hair mask, but we've honestly never thought about what the skin beneath our hair needs from us. Garrett Markenson, expert hairstylist and Reverie founder, is here to change that — with Cake. Okay, so it's not actually cake for your hair (as if we'd do anything with dessert other than eat it). Markenson's Cake is an anti-aging scalp serum — one of the first of its kind. However, like actual cake, it's a feel-good indulgence that we deserve, dammit. The product, which launches this month, is destined to be a category game changer, thanks to the fact that it contains Swiss apple stem cells. This relatively new super-ingredient is having a moment in the spotlight because of its borderline-miraculous anti-aging properties. We've already gushed about what happens when you put Swiss apple stem cells on your face, so it makes sense that similarly wonderful things happen when they're applied to the scalp. 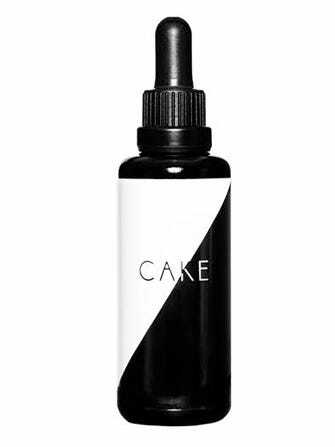 The Cake serum, which smells like expensive bourbon and pastries, stimulates cell growth in the scalp. This leads to a more hydrated, healthier scalp — and thicker, smoother, less oily hair. Using Cake is simple: You just massage it into your scalp when your hair is wet, applying as much as you want. (Though, with its relatively high price, you're probably not going to want to use all that much at once.) Your hair doesn't even need to be clean, just wet, since the product could weigh down dry hair. It's a quick extra step that makes a long-lasting difference. After two weeks of regular use, we're losing less hair in the shower and find that our mane feels cleaner for longer. We've also found that our locks have more volume. It's particularly soothing in the days immediately after getting your hair colored. All in all, this chic glass bottle just earned itself a permanent place in our hair-care routine. Reverie by Garrett Markenson Cake, $72, available at Reverie.